I know I’m not the only one who does this – open the fridge, take out a bunch of random items, open the pantry, see what else you can find (nuts, dried fruit, honey) – all the while, trying to figure out how to make it work together. Well, that’s how this salad came about. And you know what? I like it. It treads on the strange side, I admit, but it’s really delicious and helped me push past the ”salad wall”. Oh ya, the salad wall is a real thing. It usually happens after X amount of days of eating salad for lunch and then blah – if you have one…more…bite…you just can’t. That’s when your salad needs a makeover, do-over, move over intervention. Try this! The sweetness of pear, raisins, and carrots mixed with the tang of lemon juice, and the slight bitter of dark leafy greens works well together and is all together quite the palate pleaser. 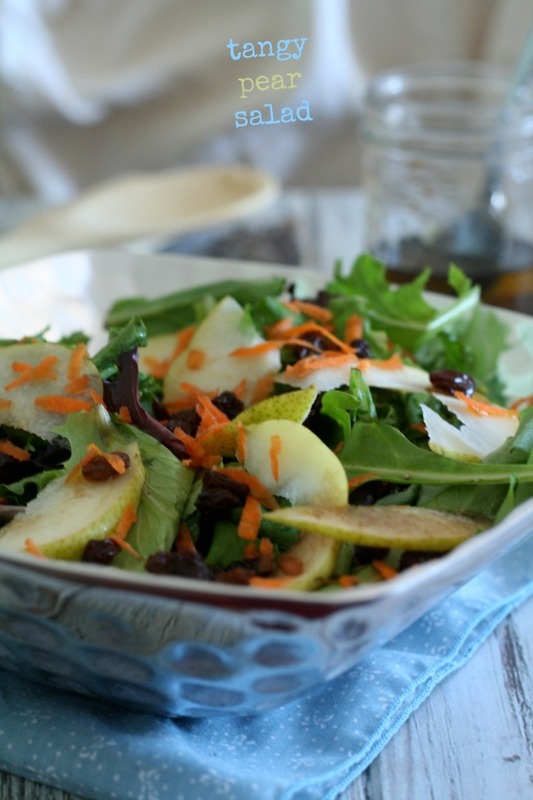 Tangy vinaigrette over fresh, fruity pears, grated carrots and sultana raisins - for an enjoyable lunch or side salad. 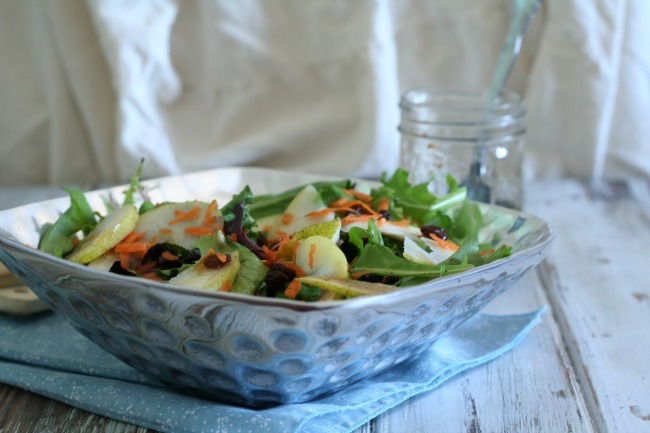 In a large bowl, layer lettuce, onions, carrots, pears, and raisins. Make the dressing by combining oil, vinegar, raw sugar, lime juice, salt, and pepper. Thank you Helen, I’m glad that I could be of service!! I will definitely check out your fashion blog – I like that you are focused on affordable fashion pieces, that is much more realistic for most people 🙂 Thanks for visiting. Thanks for the great recipe! I look forward to making it as soon as I get some pears ;P It looks delicious and I can’t wait to try it! And yes the salad wall is real!!! Hahaha, I’m glad I’m not the ONLY one that has hit the salad wall 😉 Thanks, I hope you enjoy it Nala. Hi Barbara, thanks so much! Please feel free to share the recipe with credit. Happy holidays!